The early departure clears the way for Gov. Phil Bryant, a fellow Republican, to appoint an interim successor, and sets up a special election Nov. 6. 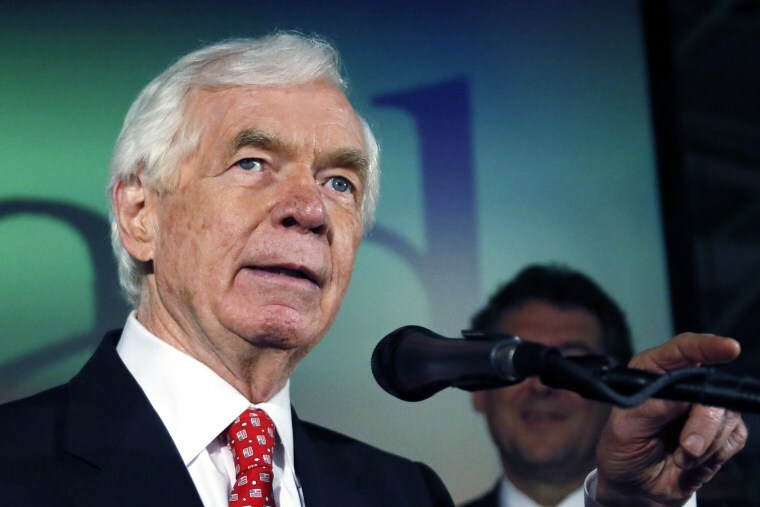 WASHINGTON — Citing ill health, Sen. Thad Cochran, R-Miss., chairman of the Senate Appropriations Committee, announced Monday that he will resign his Senate seat, effective April 1. "I intend to fulfill my responsibilities and commitments to the people of Mississippi and the Senate through the completion of the 2018 appropriations cycle, after which I will formally retire from the U.S. Senate," Cochran said in a statement released by his office. The early departure clears the way for Gov. Phil Bryant, a fellow Republican, to appoint an interim successor — perhaps Lt. Gov. Tate Reeves — and sets up a special election on Nov. 6. It also raises the possibility that State Sen. Chris McDaniel, who announced a primary challenge to Republican Sen. Roger Wicker last week, will switch races to take on Bryant's pick. "It's a bit premature," McDaniel told NBC News Monday when asked whether he might change targets. "In politics you keep all your options on the table ... never foreclose possibilities." The new fight might also be an easier one for McDaniel because President Donald Trump has already endorsed Wicker. With the expectation that Cochran would retire, conservative donors and activists have been plotting for months to make a play for both of Mississippi's Senate seats this year. A Super PAC called "Remember Mississippi" — a reference to McDaniel's narrow loss in 2014 — has been stocked with more than $1 million in contributions, much of it from billionaire Robert Mercer. Top Republican officials in Washington, including Senate Majority Leader Mitch McConnell, R-Ky., have tried to persuade Bryant to appoint himself — or technically, to step down in a deal to have Reeves appoint him — but people close to the governor say he's not interested in the job. Complicating matters, Reeves, who has long been considered the top Republican contender for the governor's job in 2019, might not want to leave Mississippi for Washington. Asked last week whether he'd given up on getting Bryant to take the job, McConnell told NBC News "There's no retirement yet to respond to, so we'll just keep an eye on what goes on." Bryant has some time to consider his options, as Mississippi law gives him a 10-day window after Cochran's Apr. 1 resignation to name an interim senator. Cochran was first elected to the Senate in 1978 after a three-term stint in the House. He currently ranks 10th on the list of the longest-serving senators in American history.